Turkey has been an interesting experience for economists in many aspects. A central bank keeping the real interest rates extremely low in a period when the country suffers from savings gap and high inflation may be among them, despite a good economic performance. Pretending that the central bank is the only game in town is inherited by the world of quantitative easing, where developing economies are besotted with a cheap money which has been in place for almost a decade. That decade is over and audience does not have any opportunity for a curtain call. So far you have read a story which you are probably familiar with. From now on, we are solicitous to provide some insight supported by some data about how effective Turkish central bank has been in shaping the credit markets through interest rates. At this point, we look for correlations between loan rates and the average cost of funding rate, which was originally made in Turkey, through a system called “interest rate corridor” in which the central bank can determine the effective fund rate in a considerable wide margin. 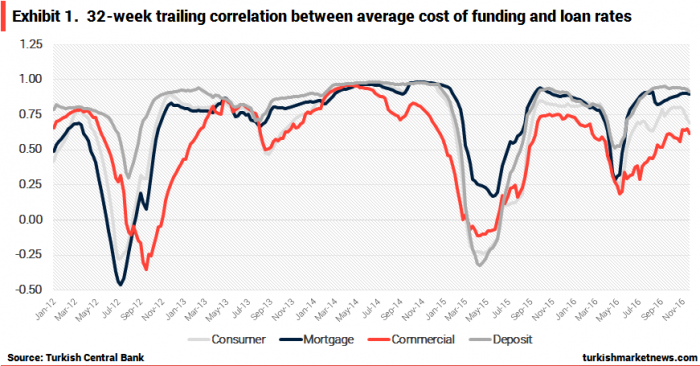 The chart above show the 36-week trailing correlation between the effective interest rate between implied by the central bank and the rates for direct consumer, mortgage, commercial lending and deposits. There has been cycles when apparently central bank lost its control over credit markets. The first cycle, in our view, was solely based on this unorthodox monetary policy framework as discussed above. Having said that, the following two cycles are products of banks’ weakening appetite for lending growth. We attach important to the last two because it shows when loans to deposit rates when through the roof, banks deliberately lift their rate that loans and deposits carry without a tightening signal for the reserve bank. That is simply how to be functionless in determining the interest rates for the banknotes you issue. This view is also supported by lead-lag analysis that suggests loan growth surprisingly lead interest rates.